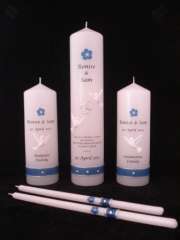 This beautiful, youthful candle set features a special personal touch through the addition of a blue stylised hibiscus, created by the brother of the bride. AS FEATURED IN BRIDE & GROOM MAGAZINE # 70. View photos of Ronise & Sam's wedding day. All decorations are hand-crafted in wax and laquered for extra protection. + All candles are finished with a matching blue wax band, edged with fine silver wax ribbons and finished with sparkly Swarovski crystals. The text is protected by a fine layer of clear wax. This design can be adapted to smaller or larger candle sizes.